Installing and maintaining solar photovoltaic (PV) systems requires hands-on skills and troubleshooting ability across the types of PV systems commonly used such as AC, DC, and grid-connected. Budding engineers and designers need to understand the technologies used in these systems as well. The 950-SPT1 includes all components needed to develop hands-on, job-ready skills: all solar specific components as well as balance of system items. 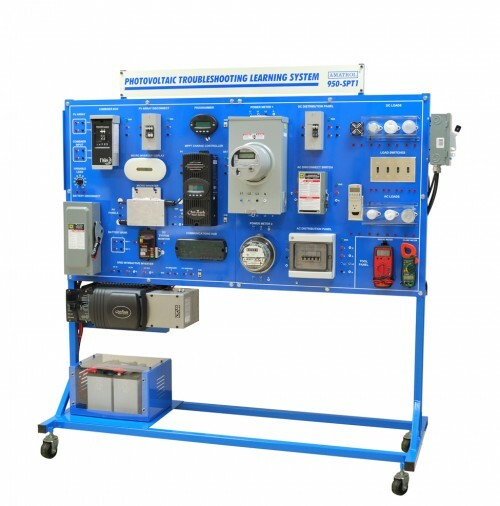 The solar photovoltaic PV learning system contains a mobile workstation, component panels with breakers, combiner box, MPPT charge controller, lamps, batteries, meters, grid-connected inverter, a fault insertion system, PC-based multimedia student curriculum, and instructor’s assessment guide. The required 95-SPA1 two-panel array provides a complete solar PV troubleshooting experience. can identify specific areas the student needs to improve and target those areas. It also allows instructors to set-up faults ahead of time, allowing students to perform self-directed study when appropriate. Developing installation and troubleshooting skills for PV systems requires all the components commonly found in these systems. Elements included on the 950-SPT1 such as power distribution panels, a combiner box, disconnects, and circuit breakers are essential to create realistic solar photovoltaic systems and troubleshooting situations. of PV system being purchased today. This is a key component that allows maximum economic return – owners can sell excess power to the utility. Likewise, when solar power is not sufficient, additional power is often needed from the electrical grid. Amatrol’s 950-SPT1 includes a micro inverter in addition to the grid-tie inverter. This is also a very popular option that is frequently used to assign an inverter to each PV string. Both of these inverters are required to teach skills across all major types of AC systems including stand-alone AC, grid-connected AC, and grid-connected AC with storage. Modern solar technology installations frequently include network communications. The inverters and charge controller on Amatrol’s Solar PV Troubleshooting enable students to learn how to network system components. Students also learn how to troubleshoot at the system level as well. 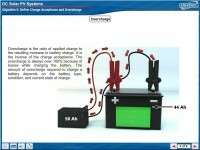 The inverter and charge controller feature many modern programming capabilities which allow students to learn how to program the more sophisticated systems they are likely to encounter. The required PV array for the 950-SPT1 contains multiple panels so that students can learn to connect a realistic array. Most solar technology applications have multiple panels. Students need to learn about the effects of series and parallel connections, which require more than one panel. Additionally, the 95-SPA1 Solar PV Array Station is mobile, allowing instructors to take advantage of sunny days without having to move the entire trainer. The array is equipped with sun simulation as well to enable indoor use.